North Ayrshire Women’s Aid needed a content managed site, which would appeal to women. 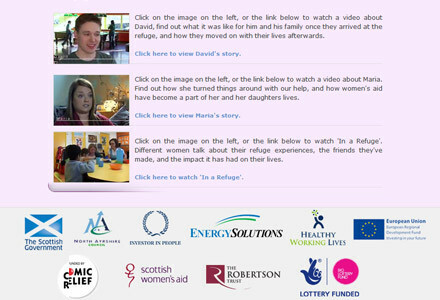 They had a logo and some videos which had been produced for them by the national Women’s Aid organisation. This job included the delivery of a secure Forum to enable women in remote areas, or those unable to access the 1-to-1 service, to receive counselling and support online. The job was done to the client’s design, and with the follow-on training they were able to further customise the site themselves.